CaMK4 is upregulated in podocytes from autoimmune/nonautoimmune kidney diseases. (A) Representative images of immunofluorescence for nephrin or CaMK4 from patients with LN (n = 10) or FSGS (n = 10) or from a subject without renal disease. Green or red color represents nephrin or CaMK4, respectively, and merged figure shows the signals from nephrin, CaMK4, and DAPI staining. Scale bar: 50 μm. 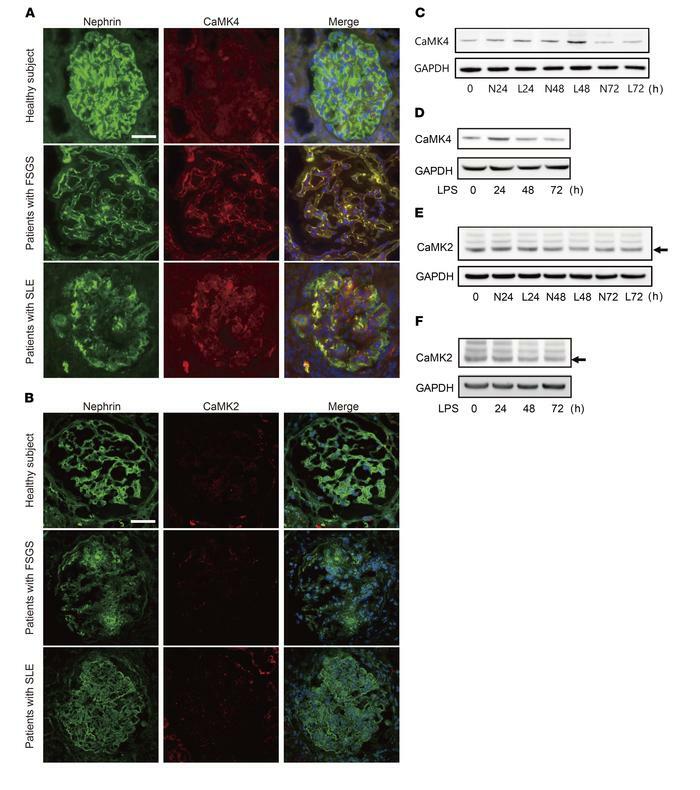 (B) Representative images of immunofluorescence for nephrin or CaMK2 from patients with LN (n = 10) or FSGS (n = 10) or from a subject without renal disease. Green or red color represents nephrin or CaMK2, respectively, and the merged figure shows the signals from nephrin, CaMK2, and DAPI staining. Scale bar: 50 μm. (C and D) Time course of CaMK4 expression in human podocytes after exposure to IgG from LN patients (L) or healthy donors (N) (C) or LPS (D). The data are representative of 3 independent experiments. (E and F) Time course of CaMK2 (arrow) expression in human podocytes after exposure to IgG from LN patients or healthy donors (E) or LPS (F). The data are representative of 3 independent experiments.